Size of Male: 45-70 lbs., 22-27 in. Size of Female: 45-65 lbs., 21-26 in. 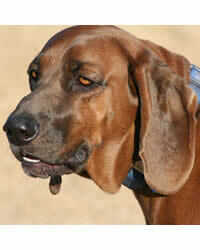 The Redbone Coonhound is a handsome and healthy dog breed. For the hunting hobbyist who embarks on frequent trips to the wilderness, this might be the breed for you. This hound dog is a natural and ideal sidekick to capturing raccoons, bobcats, possums, cougars and bears. The Redbone Coonhound belonged to a collective group of dogs that descended from bloodhounds and foxhounds in the early 1800s. The hunters who bred these dogs desired to produce a superior breed – one with a keener sense of smell, an outstanding speed and the versatile ability to hunt both small-sized and huge-sized game. A series of selective breeding experiments produced the desired outcome. The black saddlebacks emerged first and when the breed underwent refinement, the Redbone Coonhound finally came to be. This is one of the latest breeds to receive official recognition from the American Kennel Club in 2009. Hunting and chasing instincts are hardwired in this breed. So although you can have a Redbone Coonhound as a pet, you can’t expect the dog to be the perfect family companion. This dog breed can still be affectionate and inactive indoors. However, it is by nature energetic and predatory. It will run after anything that moves, ignore your commands in favor of a sniffing trip and venture outside, only to get lost. Loud baying and destructive chewing are quite common among these dogs when their exercise needs are not adequately met. Living Environment – Remember to keep your area securely fenced. These dogs can dig their way out of your yard and go wherever an interesting scent takes them. This measure is also a precaution to benefit cats and other small neighborhood pets. Some can adjust quite well to apartment living, as long as you don’t neglect their exercise needs. Grooming – Despite their distinctive odor, this dog breed requires minimal coat care. An occasional bathing or brushing will do. You should be prepared to exert some effort in maintaining the upkeep of your home, however. You have doggie drool and smell to deal with everyday. Diet & Exercise – To keep your dog robust, most experts recommend serving a fresh food diet over a commercial high-quality substitute. Do not mistake fresh food with table scraps or human food though. Raw vegetables and some grains will do, but do not omit protein from the diet. They particularly savor cooked chicken, beef, fish or venison. Adequate exercise is one of the things that will keep the breed happy, fit, calm and well behaved. You’ve got to have a thing for swimming, hunting, hiking and running to be in sync with your pet’s lifestyle. Health – In canine history, the Redbone Coonhound enjoys the distinction of acing the health department with zero known major or minor health concerns. Hip exams are recommended but these haven’t turned up any cause for alarm. There’s no doubt that Redbone Coonhounds are trainable. They are intelligent and they are eager to please their owner. Generally, however, the dogs have a manipulative and stubborn streak in them. Their predatory nature and their attraction to movement and sounds may often interfere with the training. Confidence, consistency and the right reward practices are necessary. Start with obedience training before teaching your dog other commands.